Running alongside your pooch can be a process but you both can successfully get a workout. 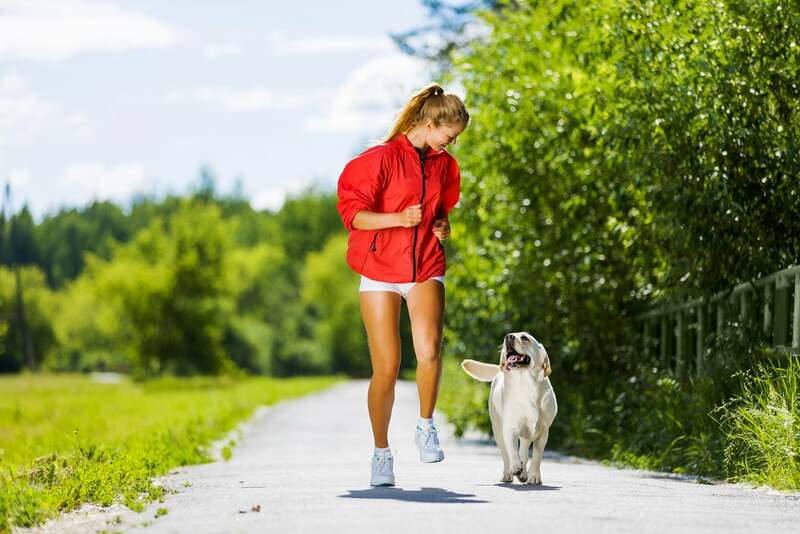 Running alongside your pooch can be a process but with just a few minor changes and things to look out for, you both can successfully get a great workout. Trainer and run coach, Angela Tieri of DIAKADI Fitness Facility, shares her workout experience with her dog, providing insightful tips for both of you to get the best workout. Tieri has been running with her adopted Border Collie mix, Queso, for a few months now. Since she didn’t know his exercise history, Tieri started slow with his running—just 20-30 minutes at a time, a few days a week. 1. Add distance over time. You have to build up slowly, just like with humans. Tieri’s longest run with Queso has been 9 miles. She always makes sure to bring water or plan routes with water fountains for the pup. She even bought him a little backpack to wear on our trail runs so he can carry water and treats for the both of them. Tieri usually runs with her dog in the afternoons, and prefers trails so they don’t have to worry about cars. You should do a little research beforehand to make sure dogs are allowed on the trails you are planning on running, since not all are open to pets. Keeping your dog on leash (for safety against other dogs, mountain bikers, and other animals) can change your form a bit. Arm swing on one side can be restricted, which can make you feel off-balance, so try to switch the leash from hand to hand often. There are leash attachments that clip around your waist, but be wary of using one, especially on trails, in case you or the dog falls or he takes off after an animal. For early morning and night runs, Tieri got her dog a reflective vest and glow collar to make sure he is seen by drivers. Running with a dog can be frustrating at times (like when trying to run with a bag of poop in one hand and a leash in the other), but it is so great to have an adventure buddy who is always excited to join you on the trails! Tieri is training for a marathon, so naturally she has workouts planned a few days a week. On these days she will take Queso out for an easy 3-mile jog a few hours before or after her workout. On my recovery days they will go for a longer run together, up to 7-8 miles, usually on trail. Running with your dog is a nice distraction from intense marathon training. Tieri tends to forget about specific paces, thanks to Queso’s frequent bathroom and sniffing breaks. Who Makes The Best Type Of Running Buddy?